Expectations getting the best of me? What was I trying to do? Exercise. I wanted to finished my workout and my son had lots of questions and comments! He wasn’t getting in the way, but my brain was just having a difficult time processing his questions and following the DVD’s instructions. He wasn’t doing anything wrong. If I had told him to play in his room and not interrupt me I would have grounds for being a little frustrated. But I didn’t do that. I just popped the DVD in and hoped for the best. The “this” she was referring to was the stacking of blocks. Usually, if she had worked hard to build some sort of block structure and the baby knocked it over, she would be disappointed (and possibly angry). 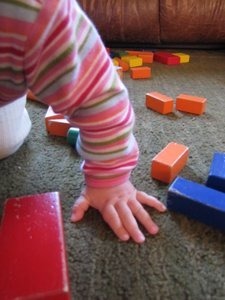 But, today she was building block towers fully expecting to have them knocked over. So it was no big deal. I smiled to myself as I punched and kicked along to the music, my son joining in beside me. This is what I’m doing it for! I had children because I wanted children. They require a lot from me. I invest in them daily. Sometimes I do it well, many times I don’t. This was a good reminder for me to be careful with my expectations. To reach for the best, but to also live in reality! It is not fair to allow my un-realistic expectations to cause frustration. Instead I need to roll with the punches. And if I really want to work out un-interrupted, then I need to set that up ahead of time. Family Fun: Have a Family Workout Night! Awesomeness. Loved this because I tend to set up everyday like that – expectations are waay too high. Unreachable! I keep trying to clean and fold laundry and every time I set to do it, someone needs me (I have 5 children). It gets frustrating! But yes, like you said, I need to roll with the punches. I wanted these beautiful children, too. You said it perfectly – they require a lot from me. The sooner I realize that the better! I was going through some old posts and saw this comment from you. Obviously I never responded to it! But, I just wanted to say thank you for leaving such thoughtful, kind comments. You have always been so encouraging. I really needed this. We are in the throes of toddler-dom, and it is so so hard for me right now. But I love her with all my heart, and no matter how frustrated I get I remember that. Thank you.